The <access> element allows you to configure whether a Web site or application uses client certificates for authentication and allows you to define the cryptographic strength required for encrypting those certificates. None. This default setting disables SSL for the site or application. Ssl. 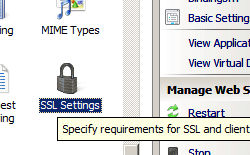 The site or application requires SSL. SslNegotiateCert. The site or application accepts client certificates for authentication. SslRequireCert. The site or application requires client certificates for authentication. Ssl128. The site or application requires 128-bit SSL certificate encryption. You can use the access element to configure a site, an application, or a virtual directory to require client certificates. To do this, set an HTTPS binding for your site or application, and then request and receive certificates from a certification authority (CA). The certificates can be Internet Server certificates, domain server certificates, or self-signed server certificates. Internet Server certificates require a CA issue your server or servers a certificate after you request one. A domain server certificate is issued by a CA computer running on your company's domain and can help you control access to internal resources to only employees who have installed the certificate. You can use a self-signed certificate to troubleshoot third-party certificate problems, to manage Internet Information Services (IIS) 7 remotely, to create a secure private channel between the server and a selected group of users, or to test application features that rely on SSL. IIS 10.0 The <access> element was not modified in IIS 10.0. IIS 8.5 The <access> element was not modified in IIS 8.5. IIS 8.0 The <access> element was not modified in IIS 8.0. IIS 7.5 The <access> element was not modified in IIS 7.5. 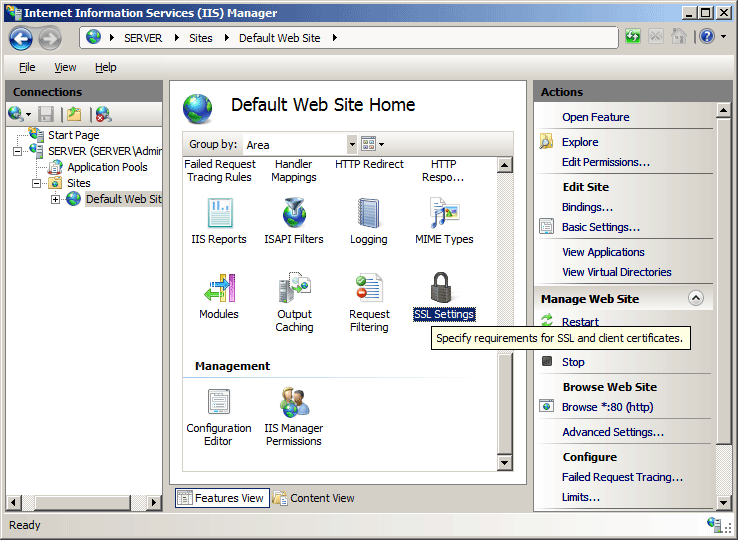 IIS 7.0 The <access> element was introduced in IIS 7.0. IIS 6.0 The <access> element replaces the IIS 6.0 SSLAlwaysNegoClientCert and AccessSSLFlags metabase properties. The <access> element is included in the default installation of IIS 7. You can configure the <access> element at the server level in the ApplicationHost.config file or at the site, application, or directory level in the appropriate Web.config file. sslFlags The sslFlags attribute can be one of the following possible values. The default is None. Accept client certificates for authentication. Require clients certificates for authentication. The following configuration example, when included in the ApplicationHost.config file, requires an SSL connection between a Web site named Contoso and all client browsers. The following examples make SSL required to access a Web site named Contoso.